The LEAD Programme was recently established by the IUA Equality network. 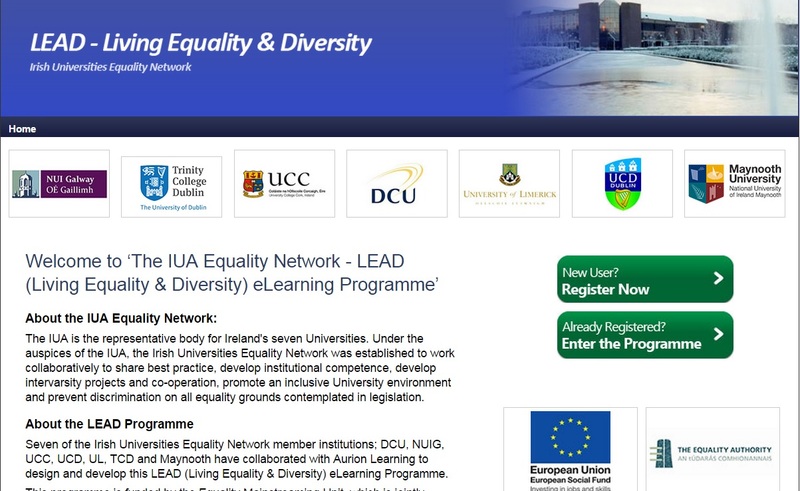 It’s an eLearning programme focusing on equality in higher education. The programme is being rolled out by the Human Resources (HR) Department at Maynooth University and is also available in other Irish universities. The HR Department asked the Library to do a pilot of the programme for the University. I was pleased to be part of the pilot group of eight. I have some experience with online learning, having co-ordinated the National Disability Authority’s online elearning programme here a few years ago. I wrote about that for An Leabharlann and for Sconul Focus. I also presented two posters on the programme, which can be viewed online (1, 2). The LEAD online programme is free of charge. Register online at: http://www.leadequalitynetwork.com/. The Programme is very clearly presented and easy to follow. There are five modules and it is estimated that completing all of these will take two to three hours. It took me approximately two hours overall to complete the five modules. I found it very useful that I could dip in and out of the programme and didn’t have to finish it at one sitting. If you don’t login for a few weeks you will get an email reminder, which is automatically generated. The programme explains the nine areas covered by Irish Equality legislation. It also links to the equality policies in each of the universities. The programme combines interactive audio, vox pop scenarios, text and interactive questions, opinions from university staff countrywide as well as a text only option. There are quick fire question/answer sessions and an overall assessment when each module has been completed. Modules are very clearly laid out with a list of learning outcomes at the start and a series of assessment questions at the end. Nine out of thirteen questions need to be answered correctly to pass the course. The layout is very fresh and up to date. I found the ‘Opinions on Diversity’ section particularly informative and interesting as it contained personal thoughts of people from several cultures on what their idea of diversity was. Regardless of the words used to describe a person’s idea of equality and diversity it all comes down to the same thing acceptance and fairness. After completing the programme I felt that I have a much better understanding and knowledge of what equality and diversity is. I feel that this will bring many things that will enhance me both professionally and privately; curiosity about different cultures, which can sometimes be lost during day to day life, awareness of gender equality, tolerance, empathy and a realisation never to pre-judge. I would strongly recommend this course to everyone. After successfully completing this excellent course it was a delight to print off my certificate of achievement.